Woman Holding an Umbrella, photographer unknown, c. 1900. From the William P. Turner Photograph Collection, Pitts Theology Library, Emory University. 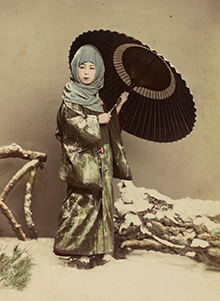 A new exhibit of 19th-century Asian objects and antique photographs will feature materials from the Oxford College Collection of Asian Artifacts, the Stuart A. Rose Manuscript, Archives, and Rare Book Library and the Pitts Theology Library. "Learning from the Empire: Japan in the Archives of Oxford College and Emory University," which opened March 9 in the Level 3 rotunda in Emory's Robert W. Woodruff Library, showcases research by Emory undergraduate students in the Fall 2015 course "Literary and Visual Culture in Japan." The exhibit includes exquisite ceramics, sculptures and photographs of dolls too fragile to be displayed, as well as rare photographs from Japan, China and Korea. Many of the ceramics and sculptures reflect Shinto and Buddhist religious traditions. The Oxford College Collection of Asian Artifacts, from which the objects are drawn, includes materials originally sent from Japan to Emory College at Oxford in 1894 by Emory alumnus William Patillo Turner at the request of Emory College President Warren Akin Candler. The class of 18 students studied the objects to help create a finding aid for future library users. Through their research, the students discovered documents and photographs from the same period in the Rose Library and the Pitts Theology Library's Special Collections that add context to the objects in the Oxford College Library's collection. "The chance to work with objects, particularly objects that haven't been curated or researched already, is an amazing experience for students," says course instructor Cheryl Crowley, interim director of Emory's East Asian Studies Program and associate professor of Japanese language and literature. "Their perspectives enriched whatever I might have been able to do myself in trying to identify these objects," Crowley adds. "It's been a great collaboration." According to library exhibitions manager Kathy Dixson, the class considered the significance of these pieces, and how they were used and perceived by students at the Oxford College museum in the late 19th century, which had been a fascinating mystery. "Now Cheryl is addressing the same questions with her students, and discovering how they perceive these objects, 100 years or so later," Dixson says. Students met with digital photography coordinator Paige Knight, who photographed fragile items such as documents and 19th-century dolls that are central to the exhibit. Knight hopes the exhibit will encourage visitors to explore the collections housed in Emory's libraries. "Spend a day in one of the many special collections and look for materials relating to your area of interest," says Knight. "We all know of the big hits in the library, the collections that easily find the spotlight. But as showcased in this exhibit, there is so much more to be discovered." The exhibit, free and open to the public during library visitor hours, will be on view through June 19.